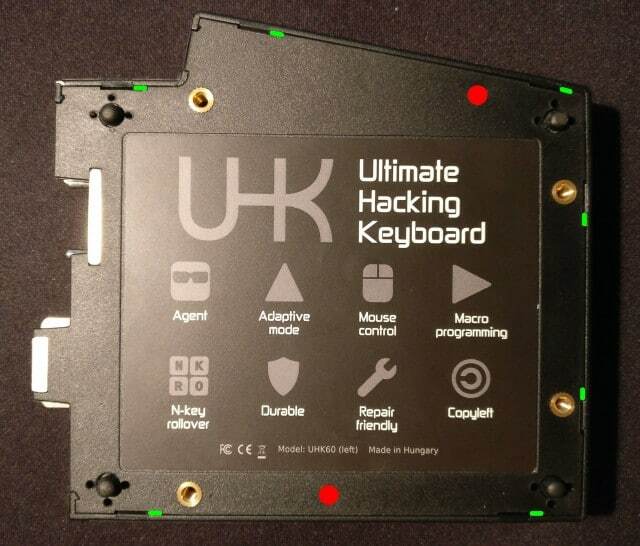 The following is an official repair guide for the Ultimate Hacking Keyboard. Given that repair extends product lifespan and saves natural resources, we're dedicated to providing repair guides for our products. Please note that we fully respect the two year warranty period, so if you ask for a replacement unit, we will honor your request with no questions asked. 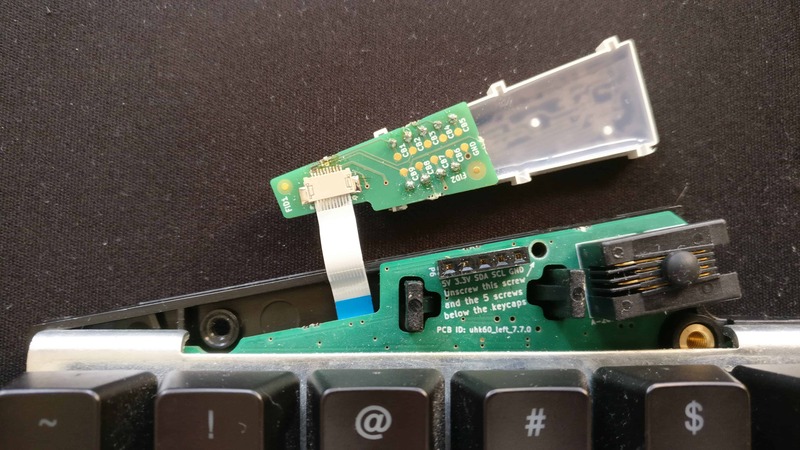 Can you see gibberish appearing on your LED display, or does it eventually go dark? Chances are high the FFC cable of the LED display got loose. This is a very rare issue that was only prevalent for the first 50 UHKs we manufactured and delivered at the end of 2017. Luckily, this can be easily fixed. Let's do this! First up, disconnect the left keyboard half, and remove the palm rest and feet if attached. Next up, unscrew the 2 screws highlighted in red. Then loosen the snap-fits either by using a flat-headed screwdriver in the highlighed green recesses, or with a prying tool. Proceed counter-clockwise starting from left bottom snap fit on the picture. Now, you can access the FFC cable that interconnects the display and the main board. Please note that if you need to further disassemble your UHK, check out the UHK disassembly guide. 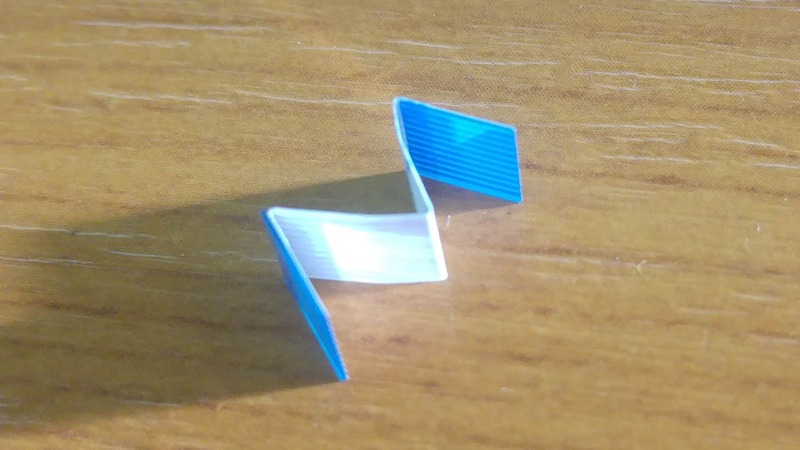 The FFC cable has a blue plastic tag at either end that should be used to push the cable in. Use a tweezer to grip the blue plastic tag and then gently push the cable into the FFC connector on the main board and also the LED display. When the cable is properly seated the LED display will work as expected. 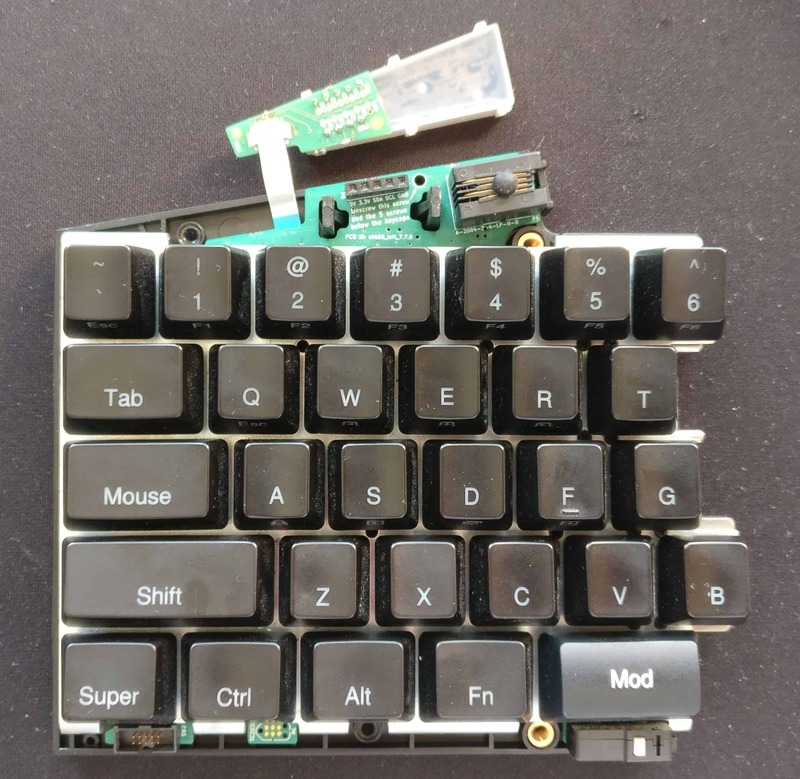 You can test this before assembling the case by inserting the spiral cable and cycling though the keyboard layouts using Fn +1 through to Fn + 5. Double tapping the Mouse, Mod and Fn keys should toggle the LED indicators for those keys. If gentle movement of the FFC cable results in spurious LED segments lighting up then you need to reseat the cable again. It can happen that the display is fine before assembling the case but after assembling the case you get spurious LED segments lighting up. If this happens, remove the case and attempt to reseat the FFC cable again using a tweezers to grip the blue tag and gently push the cable in to the connectors on both ends. If you cannot see the blue tag against the black plastic on the main board shine a light on it; it's important to use that tag to do the re-seating of the cable. Please note that if you have a pilot run UHK that has LED display issues, the above instructions may not be sufficient. We ended up bending the FFC cable in an M shape to fully solve this problem. You might have to do the same. As for the orientation of the cable, the middle part of the M should point towards your UHK. Finally, assemble your keyboard, and make sure that you snap all the snap fits of the top and back cases together everywhere, or else the top case may be permamently deformed, and the two keyboard halves may not meet accurately! Pay attention to screw properly. You should be good to go! In case your display is still shows gibberish, feel free to get in touch with us! Join the monthly UHK newsletter for product announcements, new features, and other UHK news!